Total Uninstall for Windows 10 - an application that completely removes any installed programs in the operating system. 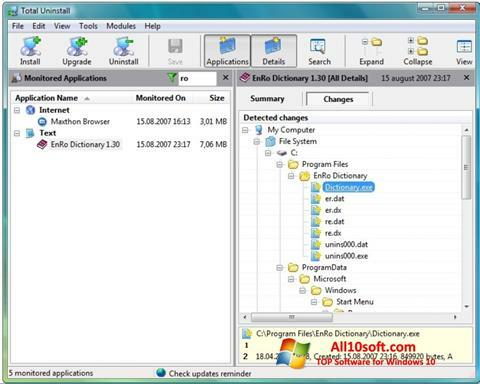 The user can view the list of available software, then select unnecessary objects and the uninstaller within a few seconds completely deletes the main and additional accompanying files, which almost always remain when cleaning the computer with the standard Windows tools. Additionally, you can use the “Observation” mode, which monitors file changes during the installation of programs. In the future, you can perform a full rollback, erasing new folders, files, registry keys and changing other parameters to previous versions. You can free download Total Uninstall official latest version for Windows 10 in English.